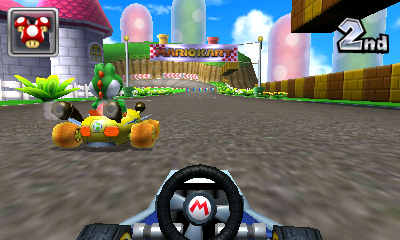 Mario and friends return to race for a chance to win the Grand Prix. There are 16 new tracks in four Cups, plus 16 classic tracks. You can now view the race in first-person mode and drive underwater. There are 17 characters to choose from, and you can now customise your kart. You can choose a frame based on the character's weight, as well as the tires, plus the new hang-glider that allows your kart to float after making a jump. 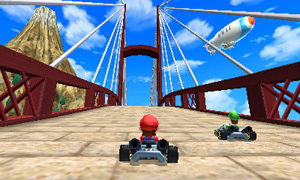 You can play online multiplayer races and battles through the Nintendo Network. You can also download player ghosts through Spotpass. The music for the stage is the main theme from Wii Sports. 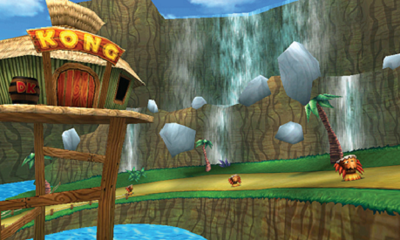 The Special Cup circuit, DK Jungle, is based on Donkey Kong Country Returns. Tikis, Screaming Pillars, DK's Treehouse and the Golden Temple all appear. This track was designed by Retro Studios, developers of Donkey Kong Country Returns.